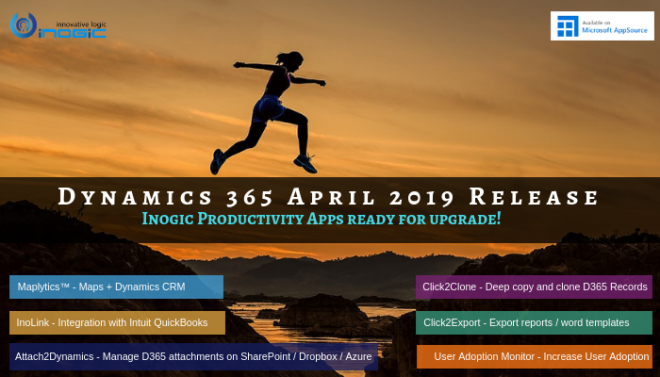 Well, the day is finally here and much awaited April 2019 release is out with more than 350 new capabilities, feature updates, and applications across Dynamics 365 and the Power Platform. There is major emphasis on making AI for Sales module more intuitive with this release. However, all the modules have been updated in one way or the other. Our flagship product is CfMD (Certified for Microsoft Dynamics) is a leading geo-analytical mapping app integrating Bing Maps and Dynamics 365 CRM. It provides capabilities like Route Optimization, Appointment Planning, Radius Search, Territory Management, Overlay and others that make it stand out in a distinct way. It is yet another powerful tool of ours that provides integration between leading accounting system Intuit QuickBooks and Dynamics 365. It provides 360-degree view of customer by synchronizing the Transaction History and Aging Details from QuickBooks to Dynamics 365. It enables users to calculate tax on Quote, Order, and Invoice in Dynamics 365. It is an extremely robust tool that maintains data integrity and security. We also have a range of productivity tools for Dynamics 365 CRM. These are dedicated to augmenting its functionality by getting embedded in CRM. Let’s delve deep and explore these products one by one. Cloud Storage integration app for Dynamics 365 for managing files and attachments on Sharepoint and Dropbox. Users can drag and drop their files and folders in an easy to operate UI and Upload/Download files and folders to/from these cloud storages along with many other functions. Users can also move/copy Notes and Email attachments to SharePoint or Dropbox to save space. Reports and Word templates provide statistical figures of an organization like accounting information, revenue report, employee data, etc. With our one-click solution Click2Export, it is possible to export Report and Word Templates. You can further Upload them to SharePoint, Attach as a Note and Auto-Send them in emails. Manually entering duplicate records in Dynamics CRM is a major time-consuming factor. To resolve this and add much more, we have introduced CIick2Clone, one-click solution to clone your duplicate records with the help of templates. It enables transmitting records with 1:N and N:N relationships. This works for hierarchies and cloning child records. Easy to implement, Click2Clone meets your business needs end to end. To track, monitor and assign tasks to the team based purely on competency we have developed a solution User Adoption Monitor. It is a powerful tool that allows the managers to view their user’s performance and what actions the team is performing. Thus, they can train better and make informed decisions about their workforce to increase the output and thus, revenue. Our team works round the clock to keep on adding more helpful features. In case any of your business needs collide with our solutions we would be happy to demonstrate them to you. Please feel free to start with a FREE TRIAL of 15 days. Already looking forward to the next release!